I’ve become a little obsessed with the hedgerows in our part of Northumberland. They’re really characterful, and although they do form a unified hedge, you can still clearly see the individual plants, each one unique. I particularly love a stretch that we pass on one of our regular walks. It’s wonderfully gnarly, and looks especially striking when it has been severely pruned, as in the top picture below. I’ve been wanting to somehow translate this strong shape into a jewellery design for a while now, and after a good deal of pondering, this pendant is the result. The hedge shape was cut by hand from silver, and soldered to the rectangular pendant. 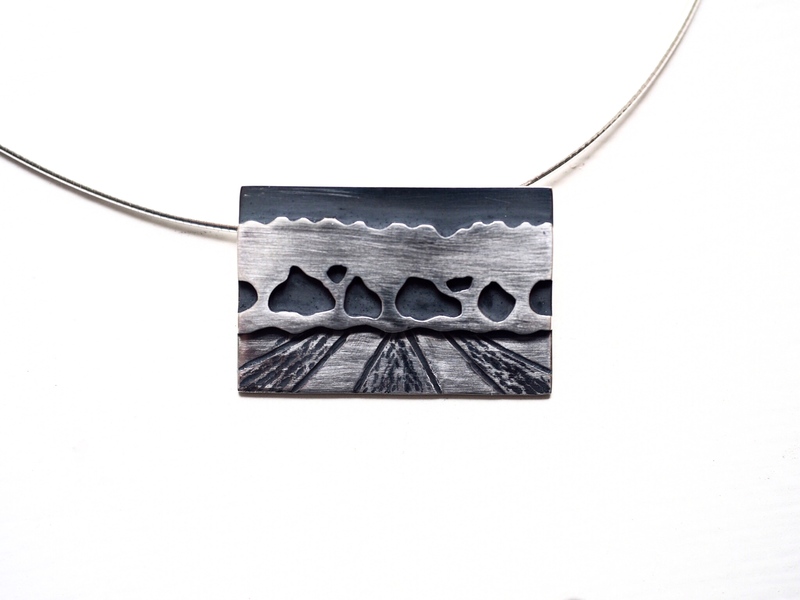 I wanted to replicate the textures and perspective of a ridge and furrow ploughed field, which I achieved through alternating hammered and polished areas. Finally, I oxidised the whole piece until it was a slate grey, then polished back the hedge and field areas, leaving the sky dark. I’ll be taking this piece with me to the Etal show on Sunday 2nd September, then it will make an appearance in my online shop soon afterwards.